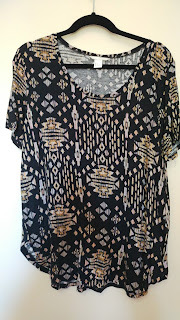 Aztec prints are vibrant and colourful. I am always drawn to bright colours even though I sometimes end up wearing a boring black tee and jeans if I'm in a hurry! The great thing about doing this daily styling challenge is that it has encouraged me to be more creative and start to wear all of the wonderful things already in my wardrobe. 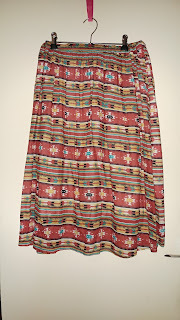 I bought this Aztec print skirt in Japan two years ago and have only worn it once previously, with a black tee. I had lots of fun styling it more creatively and loved wearing it the second time! I have lots of plain black tees in my wardrobe. Although they can be a bit drab worn by themselves, they are like a blank canvas and act as a great backdrop, allowing accessories to take centre stage! 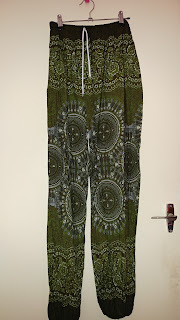 These pants were a gift from my mum who recently visited Cambodia. I love the pattern and they are so breezy and comfortable. 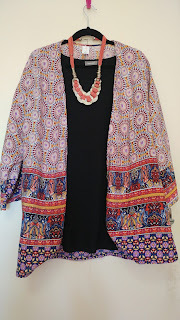 I love boho fashion, so finding accessories in my wardrobe to style them with was easy! This jacket was a recent and cheap find that is extremely versatile! It is perfect for most seasons and can be dressed up or dressed down. "Being a model is exhausting!" This top was a great (and cheap) find from H&M last year. 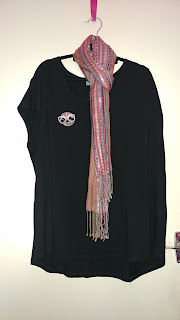 Usually when I wear this top I just pair it with black pants or jeans, without thinking too much about accessories. After looking through my accessories, it turns out I have a few nice items to match this top nicely! "What am I going to wear tomorrow??!!" Thank you for visiting! See you tomorrow! 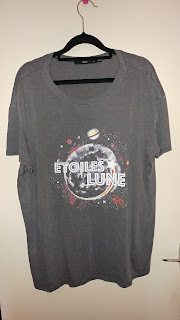 I absolutely love this grey graphic tee and was excited to find accessories to style it with. I kept to a grey and silver theme (mostly) to play up the galactic theme! The earrings: These look like they are full of star dust! The ring: I chose this ring because I thought it matched the colours of the planets on the tee nicely! The nail polish: I didn't actually have time to paint my nails this morning but this is the colour I would have chosen! Notes: (new) means it has been bought within the last four weeks so it might still be in stock if you want to buy any of the items!